A sixth person has been arrested following a police investigation into an “offensive” video showing a model of Grenfell Tower being burned on a bonfire. The Metropolitan Police confirmed on Tuesday evening that a 19-year-old man was arrested under the Public Order Act. Scotland Yard had already said it was questioning five men from south and south-east London who handed themselves in on Monday night. They are a 19-year-old, a 46-year-old and a 49-year-old, all from South Norwood, a 49-year-old from Lambeth and a 55-year-old from Beckenham. They were arrested on suspicion of intentionally causing harassment, alarm or distress under section 4a of the Public Order Act. Officers were seen searching a south London address in relation to the incident earlier on Tuesday. Three officers from the Metropolitan Police carried evidence bags into the terrace property in South Norwood. Aerial images of the property appeared to show charred patches of grass along with an England flag lying across the rear of the garden. A similar flag was visible behind the Grenfell model in the video. The property is registered to 49-year-old Clifford Smith, according to public records. After leaving the house, officers searched bins under the front window and knocked on neighbours’ doors. 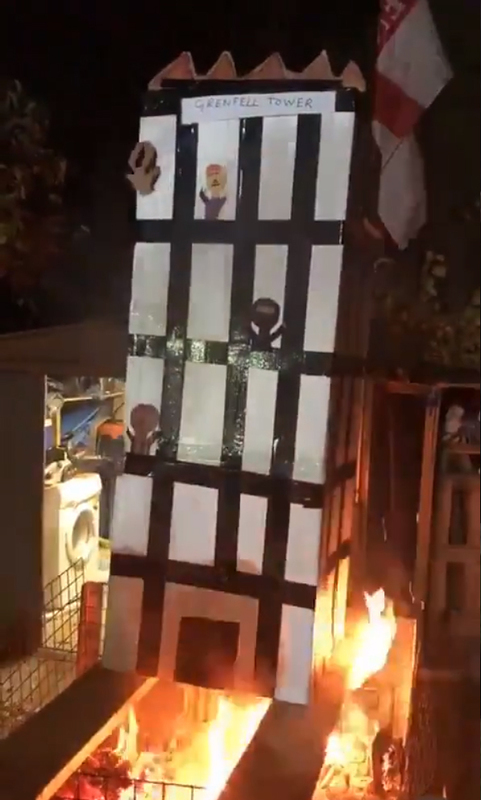 The footage, which emerged on Monday, shows a large flammable model marked “Grenfell Tower”, complete with paper figures at the windows, being set on fire. In the video clip posted online, raucous laughter can be heard off camera as the model is set alight. It is understood that all five men were being questioned at Croydon Custody Centre. The chairman of the public inquiry into the fire, Sir Martin Moore-Bick, called the video “offensive” as he opened Tuesday’s hearing. He said: “The inquiry is aware of the offensive video that was posted online yesterday. “It must be shocking and distressing to all those involved… whatever form their involvement took, whether as bereaved, survivors or indeed members of the wider community. Khadijah Mamudu, whose mother and younger brother escaped the fire, told the Press Association: “Their actions upset so many people around the world and they need to think long and hard. “When one is ignorant of the world and people that are around them they do the most stupid and vile things. Bringing up children in such an environment is cruel. “We can’t change the way they think but they need to understand they are the minority. On Monday, Prime Minister Theresa May condemned the “utterly unacceptable” video, while Metropolitan Police Commander Stuart Cundy, who is leading the investigation into the Grenfell disaster, said he was “frankly appalled by the callous nature” of the video. A total of 72 people died as a result of the tragedy at the west London block on June 14 last year.